All this month, members of the Greater New Orleans Water Collaborative are hosting a distributed festival called WATERFRONT. In keeping with our theme, Life at the Water’s Edge, participants can explore what it means to live with water through art, conversation and volunteerism. 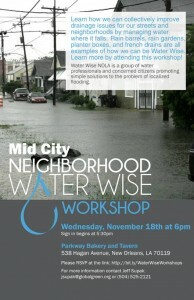 On Wednesday, Water Wise hosts a Mid-City workshop for anyone interested in how to better manage rainfall on their property. The event takes place at Parkway Bakery and Tavern at 6 p.m. RSVP here. Take part to learn ways to reduce flooding near your home while beautifying your property. The Mississippi River Delta Restoration Coalition and Life City team up to host a blue- and green-drinks happy hour Thursday evening at Freret Street Publiq House. Come have a cocktail with leaders in New Orleans growing water-management sector. Learn more about how Southeast Louisiana benefits from green infrastructure at every scale–from neighborhoods to the coast. On Sunday, November 22, we will be joined by Institute for Women and Ethnic Studies and the Lower 9th Ward Center for Sustainable Engagement and Development for an afternoon and evening at Bayou Bienvenue. The life-affirming Healing Waters event runs from 2 p.m. til 5 p.m. featuring a story telling circle that will explore the community’s multifaceted relationship with water. Then at 5:30, the Festival of Light and Water begins. Participants will mark the return of area residents with art and a lantern ceremony. Be sure to check out the full roster of WATERFRONT events here.